Back to blogging (hunting, fishing and loving everyday) Thanks for reading! It’s time for a change, or should I say changes. 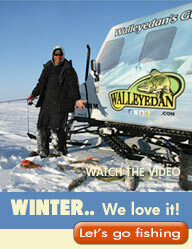 The fall is quickly turning into winter here in Minnesota and people are already hitting the ice and pulling up fish. It’s that transitional time here in Minnesota. The “north zone” duck season just closed yesterday at sunset and like so many years, it would have been nice to have had one more week. The birds are here!! And now it’s time to put away the decoys and get ready for what’s next. What is next? Well, I am always ready to go sit on stand (if the wind is right) in hopes of bagging a whitetail buck or doe. But, unfortunately sitting on stand is not paying the bills right now. That needs to be one of my goals (getting paid while on stand), but as for now I will get the ice fishing gear ready for that first trip of the season. The SnoBear is loaded with my gear but needs a serious day of organization before it’s ready for the first trip of the 2017 ice season. I will be guiding a lot this winter, so if you are interested in booking a trip with Walleyedan’s Guide Service, please call 218-839-5598 and book now. As the sun comes up on this beautiful Thanksgiving eve, I would like to say thank you LORD! We all have a lot to be thankful for, that is for sure! I’m fighting a sinus issue, but I know a lot of people that are fighting things that are ALOT worse. There really is only one cure all, and His name is Jesus. It’s pretty simple, just go to Romans 10:9 and you can be on your next journey if you aren’t already. Well, I could go on and on, but Moose (our 6 month Goldendoodle) is up and the kids are getting up for this last day of school before heading to grandmothers house. So thanks for reading and we will talk with you soon!